SRM software is a critical component of any company’s success, but a competitive sailing yacht is only as good as its crew. A company can have the best SRM system in the world, but has the team formalized a process? How about identifying its people and stakeholders? How do those people and processes interact to drive an organization to achieve its goals? Now is the time to talk about the big picture of SRM as a holistic system to help drive success. What Does SRM Stand For? SRM is short for stakeholder relationship management, but it’s a whole lot more than those three basic words. It’s a combination of methodologies and software systems that help companies build relationships with stakeholders through organization, automation, synchronicity, and—most recently—collaboration. It ties together the stakeholder issue lifecycle and distributes it across the integrated teams and functions of your business. SRM helps organizations be more effective and efficient in their day-to-day tasks and assists them in reaching long-term business objectives and goals. However, good process is nearly invisible. 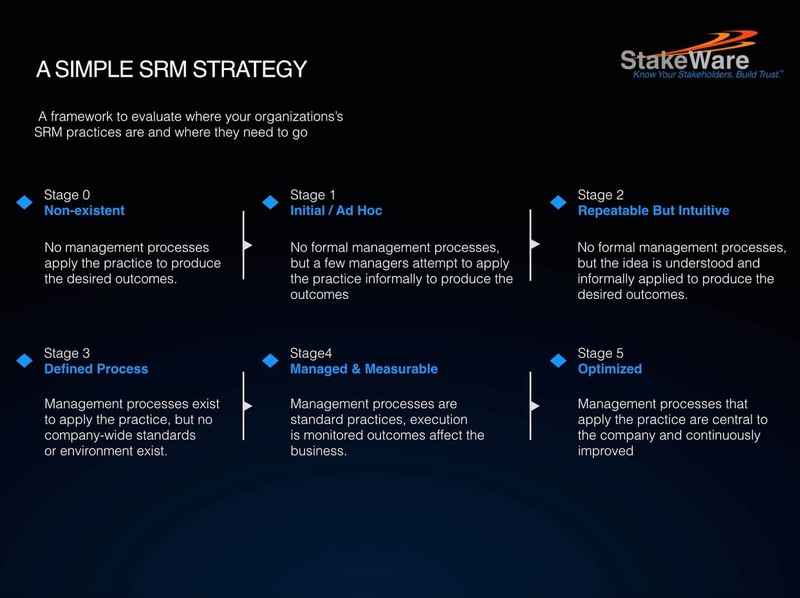 SRM must fit the organization’s processes, which are in turn driven by the stakeholder issue lifecycle. People, process, and technology are each a critical cornerstone of a successful stakeholder relationship management strategy. Not giving proper attention to each will make those pillars crumble and your structure fall. Don’t fall prey to cognitive bias—the assumption there are no problems because the process already seems to work from your vantage point, or the assumption your people are already aware of the process. Ensure your process is in place and account for the people involved in your organization before selecting the right technology solution. SRM maturity models can help organizations plan for their SRM roadmap and understand where they are in the process for full SRM mastery. A number of models exist, from the simple to the complex. Here is a simplified version to illustrate how organizations may be tempted to skip the people and process components of SRM strategy and head directly to technology. Each stage represents a step along the SRM adoption continuum. Stage zero represents no process, while stage five is the highest level of fully integrated organizational actualization, a deep understanding of processes, use, and continuous improvement beyond just using the software. Don’t get stuck in stage two or three on your organizational path to self-actualization. Understanding the people and processes behind your technology will keep things moving along. SRM is all about the people—literally. Few other business functions are as focused on people. The origin of the practice is as old as business itself. After all, every business has relationships to manage. It’s just a matter of how technology has altered the speed and ways in which we connect. Businesses invest in SRM because they believe in building trust through long-term relationships. The focus of SRM is to develop stronger stakeholder relationships, those lasting ties that help both the business and the stakeholder thrive. It’s essential to understand the stakeholder through profiles, use cases, needs, and issue lifecycle. The relationships between and among these stakeholders are key. Understanding what information needs to be shared and accessed by each party, as well as how information travels between them, will help guide a plan for SRM software. Consider building an organizational relationship map to identify critical paths in communication. Process is the structure that liberates your company to grow and evolve, and each process is unique to every organization. Take your organizational relationship map and understand who will be using an SRM system. Know what their natural process is before investing in software. One core process that most business functions revolve around is the stakeholder issue lifecycle. Stakeholder relationship management’s primary roles of CSR, External Affairs, HSE, Risk Management, Investor relations, represent functions along the stakeholder issue lifecycle. Although each has a dominant role, all work to support one another. So how does each stakeholder relationship management function address these core lifecycle events? Here are a few ways the functions work together and address each step. Stakeholder and issue identification by scanning and monitoring various sources, such as social media, hotlines, activist campaigns, direct requests for information, internal or external research, publications, grievance mechanism, expert analysis etc. Determine the type of issues and where they are in their lifecycle. Consideration of the impact the issues might have on the company or its divisions. CSR department coordinates engagement between the company and stakeholder to learn more about the issues or grievances. Internal coordination to determine the probable impact on the company or its divisions as precisely as possible. Company determines the risk and opportunities associated with priority issues. Company creates a strategic response and defines the content of the message. CSR engages to communicate response and answer additional questions. CSR communicates the response effectively with each target group in a credible form. CSR follows up with next steps, if necessary. Identification of key performance indicators and evaluation of results. What gets measured gets managed, even in stakeholder relationships. Metrics and key performance indicators can both drive process and be driven by process. Data collection may reveal a new process requirement, and processes deliver these metrics. Usage: The first basic indicator of success is login rates. Ensure users are consistently updating data, creating new stakeholder profiles. On a weekly basis, keep an eye on the number of users logged in on a weekly basis (as well as those who never logged in). On a monthly basis, focus on new stakeholders and issues created. Data quality: Check that users fill out fields correctly or incorrectly. Look out for stakeholder profiles missing certain fields, as well as those with all fields populated. Business performance: Make sure users are actually using SRM software to enhance business effectiveness. It’s also a good idea to build analytics that can uncover trends and patterns on performance (and in turn, identify any trouble areas). Defining these metrics ahead of time based on organizational goals and functions will produce a stronger, clearer vision of the best SRM software for your organization. As technology has improved over the last couple decades and become more accessible (thanks to Internet-based software), businesses now have access to powerful, comprehensive, and affordable SRM systems. Business objectives: What are your core values? What are your business objectives? This drives the intent of your SRM system. People: Who will need access to the data? What are their requirements? Process: How does this fit into the larger process among the key functions of CSR, HSE, Public Affairs, Risk Management, and beyond? Budget: How is this solution priced? Is it per seat or a flat monthly fee? What additional services will need to factor into acquiring this new software (training, IT upgrades, warranties, etc.)? Ease of use: How easily will your team be able to adopt this software? Compatibility: Is this SRM software compatible with your current IT infrastructure? Can it access the API of third-party systems? Is it compatible with mobile devices? Is it cloud-based or an on-premise implementation? Growth: Is there opportunity for expansion as your company and needs grow? Measurement: What do you need to measure and track? How is this data communicated in the software? Interaction tracking: Not only educates different departments on activity but it can also shred light on effectiveness of engagement. Your SRM system is the bank where a vast amount of sensitive information is stored. If the technology isn’t buttoned up it’s easy for information to slip through the cracks due to day-to-day activity. A recent study reveals that recovery from a data breach costs an average of $14 million per company. Understanding how specific SRM technology protects against both internal and external security breaches will save an organization money, guard against adverse public relations, and, most importantly, protect your stakeholders. External security is often top of mind when news stories break about hackers walking away with a cache of credit card information from major retailers. However, external factors rank very small on the percent of all data leaks. Only 4 percent are due to hacking and a minute 2 percent are attributed to natural disasters such as fires and floods. It’s important to address those external threats with high-security infrastructure. Consider a multi-layered security approach to significantly reduce the risk of a breach and define your roles and permissions ahead of selecting SRM software. That being said, cloud-based security is a safe and reliable route to go. Because cloud systems have far more computing power than traditional software, they can examine files nearly instantly, meaning security problems are often resolved faster than traditional software systems. Web security can also create a layered approach, which translates to additional protection overall. 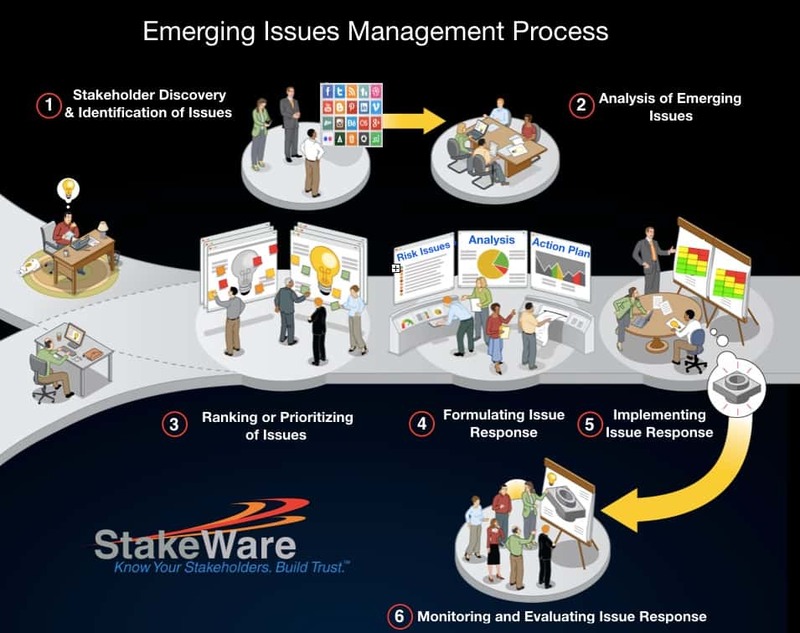 Revisit your stakeholder issue lifecycle and internal process. Where do your stakeholders access technology? How is this behaviour projected to change in the coming years? How does your internal team prefer to access their data? SRM is not just software. It’s a holistic approach to a lasting relationship with your stakeholders. Set your people and process in place before selecting the technology for the right fit. Once your technology is in place, support it and the evolving needs of your people and process. The most important factor of a stakeholder relationship management practice is human connection. SRM software should enhance individual experiences and personalize touch points, not be a roadblock to creating the emotional bond necessary for long-term sustainability.